Enjoy the quietness and loneliness of crystal clear lakes while discovering the beauty of the Lake District. 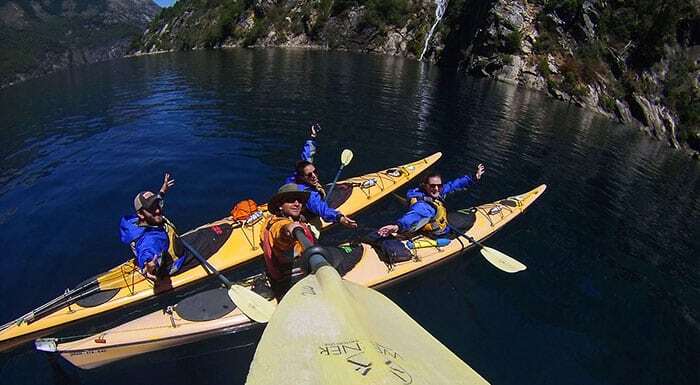 Join the local Certified Kayak Guide Juan Carlos and spend a full day navigating in the best lakes of Bariloche. 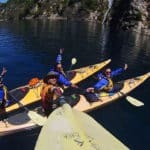 It’s a honor for me to invite you to this Kayak trip in Bariloche. During one full day we will enjoy the crystal clear waters of the lakes by kayak. We will visit all the hidden bays that Bariloche has, discovering the fauna of the region. I think that navigating these lakes offers a new perspective from which to appreciate nature. In addition, we can approach waterfowl in an unusual way to look at them closely. 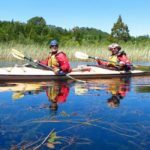 Traverse kayaking is a physically friendly activity that requires little effort. That is why it is a perfect proposal for beginners. In addition to that, I can adapt the technical difficulty of the trip depending on the level of the participants. As for the itinerary, we will leave in the morning and after a few hours of paddling we will find a nice beach where to have lunch. We will set up a picnic in the open air while we relax under the sun. In the afternoon, we will continue the journey looking for the wonderful views of the Cerro Tronador as well as the Lopez and Capilla Mounts. On sunny days, we can also swim in the lake and enjoy all its peace. After a day of adventure on the water, nothing better than ending the program in the hotel, sharing a delicious craft beer from Bariloche! The best season of the year is from October to May (spring and summer in Argentina). During the springtime it is necessary a very good climate to avoid low temps. In fact, this program is very conditioned by the weather. In windy days it can make the lakes too challenging for beginners. The approximate duration of the activity will be 6-8 hours and we will row a distance between 10 and 18 kilometers in total. Contact me for further details or if you’d like to book your place for next season. 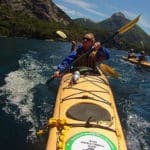 I will be happy to guide you through the lakes of Bariloche! The itinerary of the trip can vary according to the weather and climate conditions. AAGM mountain guide from Argentina. I was raised in Buenos Aires where I used to go sailing and fishing with my family during weekend and holidays. As a teenager I began traveling to Patagonia with friends to fish, hike and camp. Years later I became a rock climber and mountaineer since I wanted to asses more summits and amazing views. 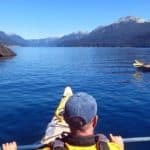 At the age of 23 and after gathering a good amount of fun ascents and traverses along Patagonia, I decided to fully commit to a life in the outdoors. As a result I started my carrier at N.O.L.S. 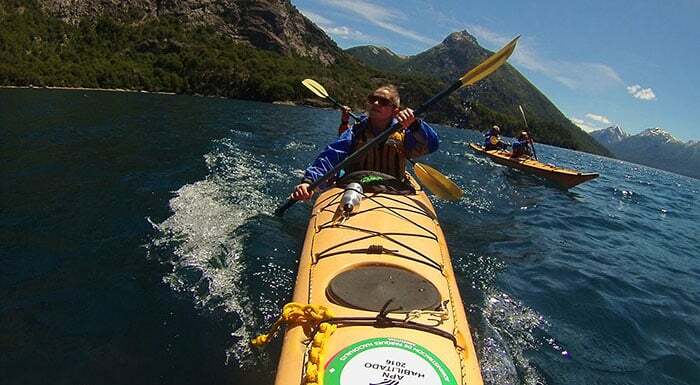 – National Outdoors Leadership School in the U.S.A. and Chile. 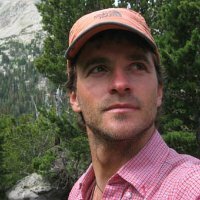 I lead rock climbing and mountaineering trips in Wyoming, Utah, Idaho, Alaska and in Aysen (Chilean Patagonia) for nine years. In 2009 finally settled permanently in Bariloche and focused my guiding work on the Lake District Region. Here I discovered new styles of guiding and service which were good to experience and helped me grow in this profession. Now I am able to mix my background on outdoor education with the guiding world and create unique experiences for active travelers. 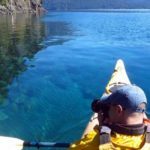 I take advantage of every season of the year, going mountain biking and sea-kayaking in the summer, ice-skating on alpine lakes during the Fall, back-country skiing during the Winter, rock climbing and mountaineering as soon as the Spring makes it way through the snow. Juan was very informative and offered a well-rounded trip; would definitely do it again! We went snowshoeing in Bariloche last July. The trip was great and Juan Carlos was fantastic! Kayaking - 3 days - Interm.